Have you ever had a day at work when your mind was somewhere else and you couldn’t focus? It might have had something to do with stress, or maybe even stress at work itself. According to the Harvard Gazette, 36% of U.S. workers suffer from workplace stress — and it costs U.S. businesses $30 billion a year in lost workdays. Stress is a normal part of work and life, but too much of it can have dire effects on team morale and productivity. As a business leader, how can you de-stress your employees’ lives so they perform at their very best? We have a few ideas. Psst...we have an entire toolkit around employee happiness complete with team bonding ideas and an employee happiness survey. You can download it here. The statistics are true: most employees’ workplace stress comes from their bosses. In fact, research has linked employees having a negative relationship with their boss to behaviors such as sleep problems, anxiety, high blood pressure, and even heart attack risk. The good news is, it doesn’t have to be that way. Management classes that tackle leadership development or personal coaching like Reboot can give your team and your managers the tools to work with employees in a positive and constructive way. You can also open up the training to your company as a whole. At Justworks, LifeLabs offers course subjects like emotional regulation, how to give difficult feedback, and managing conflict. It helps employees communicate better and be more aware of their stress levels and what triggers their stress. The more self-aware your team is around their behavior, the better equipped they’ll be to handle interpersonal challenges as they arise. If your employees are feeling profound effects of stress, it’s likely that their mental and physical health will suffer as well. Providing a safety net to address those problems will help the overall health of your employees and of your organization. 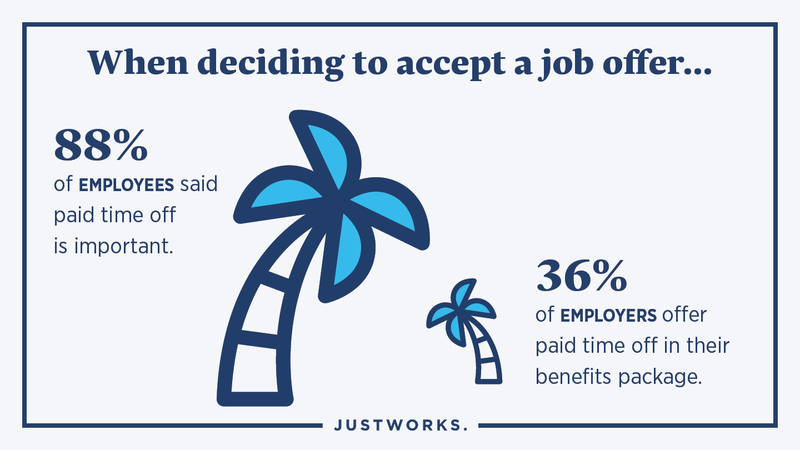 According to a study conducted by Justworks, 41% of small- to medium-sized employers provide their employees access to benefits. Although offering access to a benefits package can feel expensive at first, it has plenty of returns. 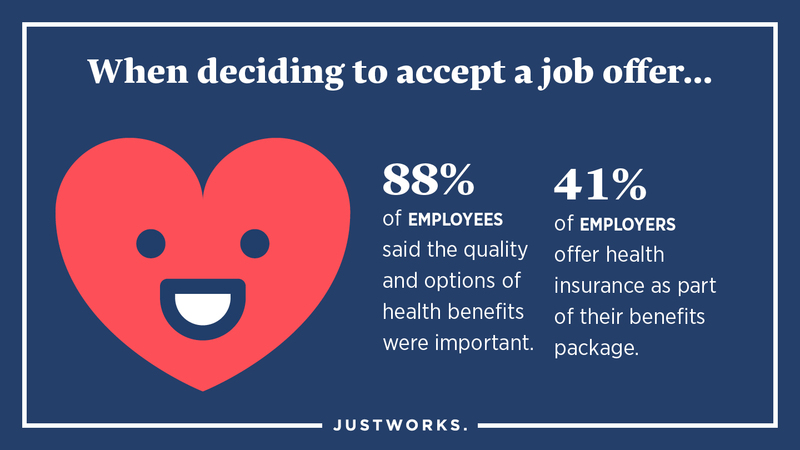 Employees with access to health insurance will perform better and be more loyal to the company, as well. According a study by Aflac, 26% of small business employees would move to a larger company for better benefits offerings. What better way to help your employees relax than to bring the relaxation to them? According to an article by the Harvard Business Review, many CEOs are taking up meditation and finding ways to bring it to their employees, because they’ve seen the immediate benefits. If you can’t afford to bring in a regular meditation coach, think about subsidizing apps like Headspace to fill in the gaps. Nothing busts stress like getting away from the office and having some fun. No matter the size of your company, try to make it a priority to offer employees paid time off (PTO) so that they can relax, rejuvenate, and come back better than ever. Unfortunately, nearly 42% of Americans don’t take vacation days. But doing so improves mental health, heart health, and even relationships. Whether you decide to offer two weeks or an unlimited policy, track time off and encourage employees to take that time off if they haven’t done so yet. As Jason Schreier wrote in The New York Times, workplace cultures that encourage non-stop work have damaging effects on their employees. He outlined a phenomenon called “crunching”, where video game developers work as many as 20 hours a day for days or weeks on end. If your employees are overloaded and continually sacrificing their leisure time to get stuff out the door, it might be time to reconsider their workload — such as hiring more employees, or changing expectations. And by encouraging them to take breaks throughout the day, employees will come back to the office less stressed and more productive. If you really want to give your employees a break, take them somewhere fun to get their minds off workplace stress and bond with each other. The possibilities are endless: you could go to a vineyard, grab a drink together at the local pub, check out a baseball game, or have a picnic in the park. The activity you choose isn’t important. What’s more important is the spirit of getting out to do something fun together, to take away from the day-to-day stress at work. Not only will it help reduce workplace stress, it will also help your employees build personal connections and work better together as a team. The team that plays together, works better together. It may sound counterintuitive to bring diversions into a place of work, but allowing your employees to let loose during the day will help them deal with stress in the workplace and boost employee productivity and morale. If any of your employees have children or an elder parent in need, the demands of work and home life can quickly become overwhelming. Allowing for employees to have a flexible work schedule will give them time to take care of the people they love, and in turn allow them to be more present at work while they’re there. If your employees perform work that could be done remotely, consider days where they can work from home as well if it makes their lives easier. Modern tools like Slack and Google Hangouts can still keep the communication lines open. Speaking of which, knowing family leave policies in the country and your state are an important piece of offering employee support. Whether or not your company decides to offer unlimited vacations, you will have to consider the varied needs and circumstances of your team. For many people, workplace stress actually centers around the difficulty of fitting life events around work — such as pregnancy, family death and illness, and childcare. We created a guide around paid and unpaid leave policies that are federally mandated (along with some other tips). That includes laws like the Family Medical Leave Act and the New York Paid Family Leave Benefits Law. Above all, the most influential step you can take as a boss is to lead by example. Justworks’ CEO Isaac Oates, for example, makes a point to take an annual vacation. The good news is, there are plenty of opportunities to show your employees that you care about their stress levels and the health of the organization at large. By facilitating open dialogue, offering PTO, and encouraging other types of healthy workplace diversions, you can help your company become a great place to work for the ages.